If I am the only law school blogger you have encountered, I am honored but I have some great news. There is a whole group of law school bloggers and let me tell you, they are pretty dang cool. Everyone has a slightly different perspective and we are scattered all over the country. Altogether, between all these blogs, anyone getting ready for law school can find a great basis for finding out what law school is really like-beyond what the admissions counselors tell you. 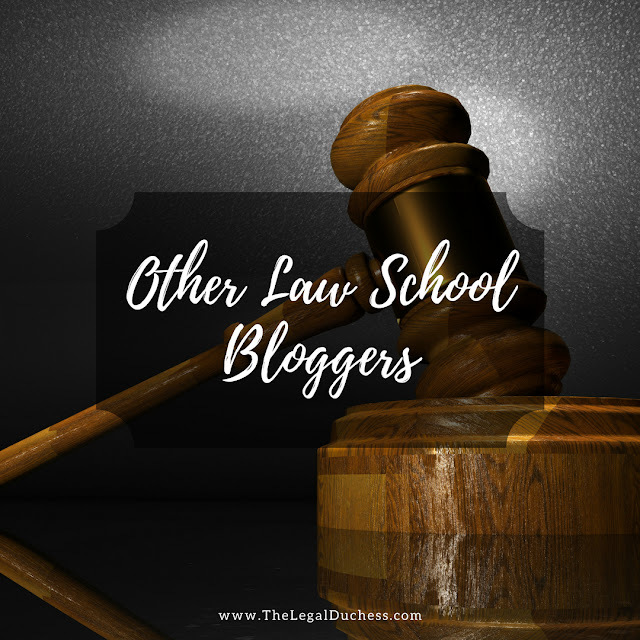 I have linked the active blogs of all the current law student bloggers that I read and follow along with with a little blurb- seriously check these awesome legal ladies out. Love this honest, law school blog. She holds nothing back and speaks the truth about law school. Also, she is obviously super smart and crushing it in law school so take whatever advice she has- I know I have! Another great honest blog full of great content. Every blogger has a different approach and style so checking out multiple is the way to really get a well-rounded view of what law school is like. I think she wins for most unique law school blogger name- I just love it. I also love her upbeat perspective and her beautiful blog site. Another valuable resource for all things law school. I Love reading this adorable blog by a fellow dog mom to three pups. She provides fantastic content and has a ton of great resources for incoming law students. Check it out for sure! While her blog isn't exclusively about law school, I love reading it. Her content is fresh and fun and so upbeat! A newer blog but it is off to a fantastic start!! She has already written so much content and all of it is super relevant and helpful. Unfortunately, I was unable to link her site because it is a protected blog. I follow and read her content on Bloglovin. This is an anonymous blog full of amazing and completely honest content. I recently stumbled across it and I am loving it so far. Another new one for me but great content so far!!! I think this is going to be a blog to watch as it keeps growing. I have to admit, I wish I was as into health and fitness as this blogger but go her regardless! Tons of great law school and fitness content here! Those are the main legal ladies I love to follow and read. I am hoping the law school blogger community will continue to grow and gain even more fantastic future lawyers! This list was updated on 8/8/18 to add new blogs and to remove blogs that are no longer active or bloggers are no longer in law school. Thanks for the shoutout, Brandy! I love the little ways we can support each other as fellow law school bloggers :) You're amazing! Aww shucks, you're making me blush :) I agree- the support is amazing. it gives us nice information.We are looking forward to read more blog. Hi guys! I would love for you to check out my new blog as well: nicoleesq.wordpress.com. Great for those just starting the admissions process or about to enter 1L!